Last night, I hunkered down in the film room (read: NFL Game Rewind) and watched the last two games of the Eagles’ week eight opponent, the hated Dallas Cowboys. To be honest, I wasn’t expecting much. The team is 3-3, including three fourth quarter letdowns. Most of the press I’ve stumbled across about the division rival has been disparaging at best. But I came away from those two games and an examination of the stats with an entirely different perspective: the Cowboys are a pretty good team. Let me start with the objective stats from Football Outsiders. Dallas excels in a number of areas. They are third overall in team defense, and first in adjusted line yards allowed by the front seven. On offense, they’re only 30th rushing the ball, but are eighth though the air. Having the fifth-best adjusted sack rate helps, as does Tony Romo’s overall stellar play. He has had some untimely interceptions in losses to the Lions and Jets, but he’s still fourth in quarterback DVOA, the highest rate of his career. Romo’s yards per attempt and QB rating are right in line with where they were before his injury-shortened season in 2010. Subjectively, the Cowboys looked very solid against both the Patriots and Rams in the last two weeks. St. Louis was a pushover, with A.J. Feeley starting and basically no one interested in tackling, but Dallas didn’t mess around. They had few mistakes, racked up the yards, and got a breakout rushing game for the first time this year. 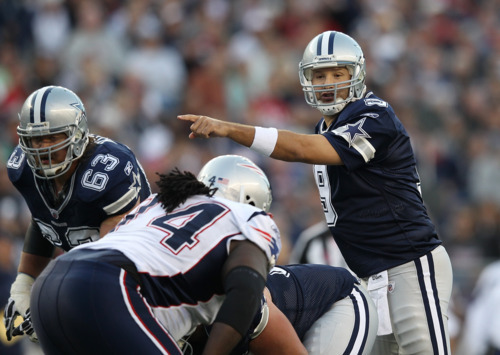 Dallas also played an even, closely-fought game against New England that Tom Brady pulled out with a last minute touchdown drive. Andy Reid always wins after the bye. Always. 15-0 including in the playoffs. But this one won’t be easy. The Cowboys have all the weapons to beat the Eagles this Sunday: a solid quarterback, playmakers at wide receiver, tight end, and out of the backfield. They have a physical, blitz-happy defense. Most games from here on out are “must win” situations for the Eagles, because they can’t afford more than two additional losses if they still want a real shot at making the playoffs. This one is more of a “show me” game. If the team really wants to give me hope that they can pull off a turnaround, a solid game against a good team like the Cowboys is where they need to start. Tagged with Philadelphia Eagles, NFL, Dallas Cowboys, Week Eight, Tony Romo, Football Outsiders, Statistics. October 26, 2011 by Brian Solomon.